Hot water has got to be one thing in a given home or office that nearly everybody takes for granted. That is, until it's not there. After all, there's probably very little that is less pleasant than having to shower or wash hands, and whatever else, in cold water. On the practical side, how do you shower, bathe, wash dishes, or do your laundry without it? The trouble is that when your hot water heater goes on the blink, what is the best way to deal with it? Is it time for Water Heater Repair in Gilbert, AZ? As good as your plumber might be, the best answer to this question is often determined by you. Your budget comes into play, of course, but a considerable amount of the decision to be made is also based on the recommendations and knowledge of your plumber. We know water heaters like nobody else. 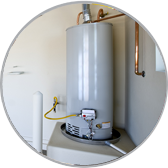 From the moment you call our Water Heater Repair in Gilbert, AZ, you will know that you are getting the very best in water heater service available. Our technicians are the reason why we can call ourselves the best. Each one is trained and experienced at dealing with practically any hot water heater problem. Further, their knowledge of hot water heaters makes it possible to evaluate your entire situation and know what is best for you and make their recommendations. Are you looking for someone who you can call when you have a hot water heater problem? Remember our Water Heater Repair in Gilbert, AZ. That's the name that you will know is equal to good service for hot water heaters and virtually anything else that comes to plumbing in your home or office. Your satisfaction is not our greatest concern; it's our only concern. That's what has made us the first name in hot water heater repair and replacement. Call us to find out how we can serve you.